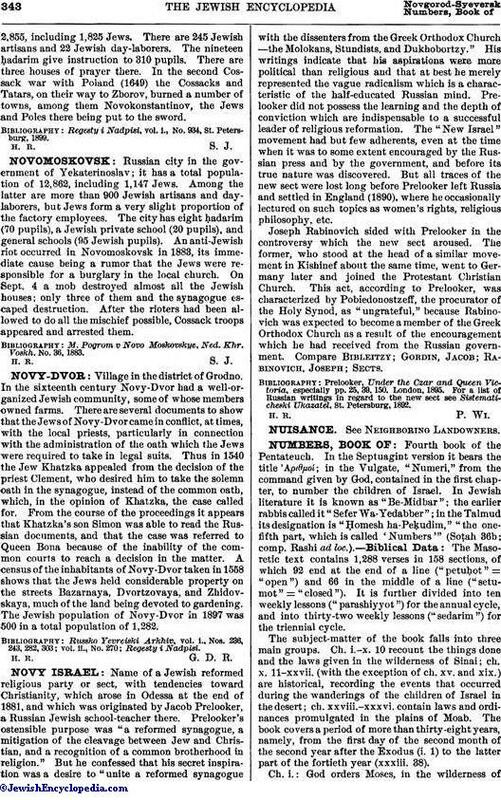 Name of a Jewish reformed religious party or sect, with tendencies toward Christianity, which arose in Odessa at the end of 1881, and which was originated by Jacob Prelooker, a Russian Jewish school-teacher there. Prelooker's ostensible purpose was "a reformed synagogue, a mitigation of the cleavage between Jew and Christian, and a recognition of a common brotherhood in religion." But he confessed that his secret inspiration was a desire to "unite a reformed synagogue with the dissenters from the Greek Orthodox Church—the Molokans, Stundists, and Dukhobortzy." His writings indicate that his aspirations were more political than religious and that at best he merely represented the vague radicalism which is a characteristic of the half-educated Russian mind. Prelooker did not possess the learning and the depth of conviction which are indispensable to a successful leader of religious reformation. The "New Israel" movement had but few adherents, even at the time when it was to some extent encouraged by the Russian press and by the government, and before its true nature was discovered. But all traces of the new sect were lost long before Prelooker left Russia and settled in England (1890), where he occasionally lectured on such topics as women's rights, religious philosophy, etc. Joseph Rabinovich sided with Prelooker in the controversy which the new sect aroused. The former, who stood at the head of a similar movement in Kishinef about the same time, went to Germany later and joined the Protestant Christian Church. This act, according to Prelooker, was characterized by Pobiedonostzeff, the procurator of the Holy Synod, as "ungrateful," because Rabinovich was expected to become a member of the Greek Orthodox Church as a result of the encouragement which he had received from the Russian government. Compare Bibleitzy; Gordin, Jacob; Rabinovich, Joseph; Sects. Prelooker, Under the Czar and Queen Victoria, especially pp. 25, 39, 150, London, 1895. For a list of Russian writings in regard to the new sect see Sistematicheski Ukazatel, St. Petersburg, 1892.